Our patients have been very happy with this new and highly personalized lens. Ask about it when you see us next! About the X Lens: With the Varilux X series, you will be able to seamlessly capture every detail within arm’s reach and beyond since it’s a progressive lens. And that is perfect for multi-taskers like we all are nowadays. This is possible thanks to new breakthrough Xtend™technology delivering the biggest volume of vision within arm’s reach that has never been achieved by progressive lenses before. All of this to ensure very little to no head movement to find the sweet spot to see sharp. X series lenses are available with a brand new personalization measurement for near vision behaviour. Using the Visio office instrument, we record the natural way each wearer uses their vision for a near vision task. How are X Lenses helping your near vision, more than other lens types? The new Varilux® X series lenses take into account the full variety of visual needs at near. These multiple near distances correspond to a sphere between 40 and 70 cm at arm’s length (at 22° to 34°). These lenses have moved from a static near vision consideration to a new dynamic n ear vision which is much closer to reality and closer to the actual needs of wearers. If you find yourself reaching your arms out further or squinting when reading smaller print, you may be showing signs of presbyopia. 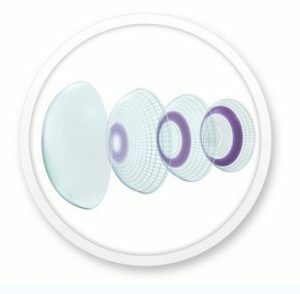 While you may be familiar with the common use of reading glasses, did you know that there are contact lenses that work very well to correct presbyopia? Multifocal contact lenses may be an option for correcting your vision, whether you want the freedom from glasses part time or even full time. Dailies Total One Multifocal is a combination of the amazingly comfortable material with water gradient technology, along with a very effective optical design to allow seamless vision from near through far. Enjoy clear vision when driving and when you need to look at your phone. 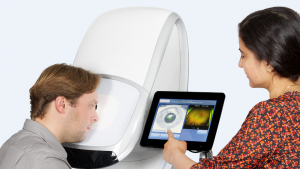 Optomap is an imaging instrument that assists doctors in the evaluation of your retina. It helps confirm the health of your retina, and also enables the discovery of abnormalities. It can be helpful to diagnose any potentially harmful diseases and if necessary, determine the best course of action. The optomap is a simple, non-invasive procedure. In less than a second we can generate a high-resolution, digital, colour image of your retina. This image becomes a part of your permanent medical record and enables us to see more of your retina, measure aspects of your eye, and magnify some of the finer details. We can also track changes in your eye over time by comparing each year’s optomap. In addition, you take a more active role in your eye care by reviewing the images with your doctor and learning more about how best to protect your vision.